Although economic inequality provokes widespread disquiet, its supposed necessity is rarely questioned. At best, a basic level of inequality is seen as a necessary evil. At worst, it is seen as insufficient to encourage aspiration, hard work and investment, a refrain sometimes used to advocate ever greater inequality. In this original new book, Danny Dorling critically analyses historical trends and contemporary assumptions in order to question the idea that inequality is an inevitability. What if, he asks, widespread economic inequality is actually just a passing phase, a feature of the capitalist transition from a settled rural way of life to our next highly urban steady-state? Is it really likely that we face a Blade Runner -style dystopian future divided between a tiny elite and an impoverished mass? 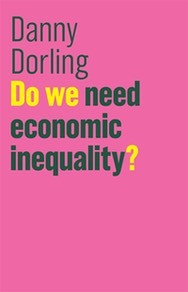 Dorling shows how a stabilising population, changing gender relations and rising access to education make a more egalitarian alternative to this nightmare vision not only preferable, but realistic. This bold contribution to one of most significant debates of our time will be essential reading for anyone interested in our economic, social and political destiny.